VIP Loops is proud to bring you So Shady Vol. 2! So Shady Vol. 2 contains 40 straight Hip Hop bangers in the style of Eminem and Dr Dre. Just like its predecessor, this product brings that dark and sinister vibe to the forefront with its hard hitting drums, haunting strings, and dark melodic guitars and synths. VIP Loops crafted this product especially for those producers that need that head knock music. So Shady Vol. 2 includes 2.75 GB (wav version) of modern, radio ready content. Use the V.L.X. engine to change the tempo of the beat with no artifacts. What is V.L.X.? V.L.X. 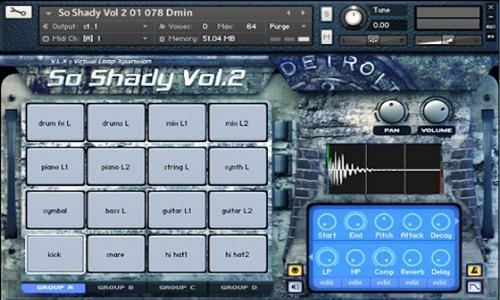 (Virtual Loop Expansion) is the specially scripted version of 'So Shady Vol. 2' for Kontakt, and it is really something special. It's an MPC padded style interface that includes time stretching, note repeat, bit crushing, and on board fx including reverb, delay, and compression. Whether it's in WAV or V.L.X. format, this is a must-have product. So hot, So Shady! - 1.286 loops, samples, riffs, and one shots.